You can prepare healthy, hot lunches without cutting into your work time. Here are five snappy lunch ideas that your kids may even enjoy. When you work from home, you have access to an oven but probably don't have much time to actually cook something. When the thought of lunch meat sandwiches turns your stomach, don't worry. There are ways to make nutritious, hot lunches quickly. Here are five quick lunch ideas that don't come from a can. Lay a tortilla flat on a baking sheet, top it with your favorite cheese and a second tortilla, and put it in the oven on 350 degrees until the cheese has melted -- about ten minutes. 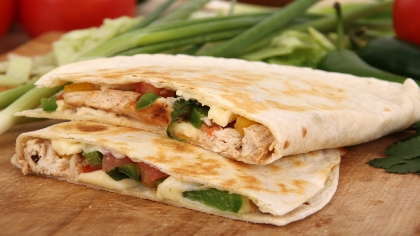 You can also make one using the microwave, which will cook the quesadilla for a shorter amount of time than the oven. If you have some precooked chicken you can add that to the mix, along with veggies like bell peppers and onion. Top with sour cream, salsa or guacamole after cooking. The next time you cook chicken for dinner, grill a few extra chicken breasts and cut them into strips. Refrigerate them to eat later that week, or freeze them so they last longer. For a quick, healthy workweek lunch, add the chicken over lettuce with your favorite salad toppings and dressing. For the kids, get out their favorite dipping sauce to dunk the chicken strips into or wrap them up in a tortilla with cheese and veggies for an easy taco. Use a whole grain English muffin as an easy and instant pizza crust. Top with pizza or marinara sauce, cheese, pepperoni, or your favorite veggies. If your little ones are old enough, let them top their own pizza and making lunch can be a fun activity. Pop them in the toaster oven until the cheese has melted. When you want meals that are both quick and nutritious, the freezer is your best friend, making quick food easy without packing it full of preservatives. Pick up a bag of premade meatballs (or freeze your own), your favorite sauce and sub buns. Defrost the meatballs before adding them to the bun with the sauce, and then pop them in the toaster oven. Make some shredded chicken ahead of time, and then when you are ready for something different for lunch, grab some wonton wraps. Add shredded chicken and cheese to the center (in a “log” form like you would a taco) and then roll it up like an egg roll: fold, roll, tuck the ends and roll again. Bake them at 350 degrees for 15-20 minutes or until golden brown. Don't let cooking lunch cut into your work time or time with your kids. There are many ways to make healthy lunches quickly. What are your favorite quick lunches? Share with us in the comments below!